Everyone I have interviewed so far is an NHC employee. But your job is different. I am a research associate employed by the University of Miami Cooperative Institute for Marine and Atmospheric Studies. 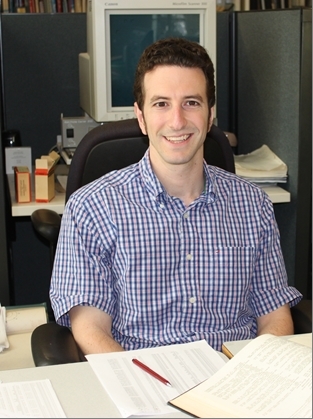 I've been working with (NHC Science and Operations Officer) Chris Landsea for the past three and half years reanalyzing the Atlantic hurricane database. For the first two and a half years, I was a graduate student at UM, but now I am an employee. To do the work, you need to be here. That's right. Even though I am paid through UM, I physically work here at NHC because the tools utilized for reanalyzing the hurricane database are located here. To do that type of research, you must have had an interest in hurricanes for some time. My interest goes back to age six. I grew up in Kendall (Fla.) and in 1992 Hurricane Andrew came plowing through there. The experience in Hurricane Andrew sparked my interest in meteorology. While in high school, I interned with the Hurricane Research Division each summer. By the time I finished the first internship, I knew I wanted to major in meteorology in college. I was hooked. Hurricane Andrew is a now a generation-removed. What do you recall from it? It doesn't seem that long ago, and I remember it well. My family and I were huddled in the hallway. We lived just north of where the eyewall passed, so we did not have catastrophic damage. Most of the neighborhood trees and all of the powerlines were down. Many people lost their windows and some lost their roofs. We were lucky. Did you do your studies locally? I attended Penn State University for my Bachelor's degree, and my Master's degree is from the University of Miami. Chris Landsea was my main advisor at UM, and I worked on the Atlantic Reanalysis Project. The reanalysis of the 1944-1953 Atlantic hurricane seasons became my Master's thesis. Those years are the first decade with aircraft reconnaissance flights into storms. What exactly is Atlantic Reanalysis Project? The Atlantic Hurricane Database contains the tracks and intensities of all tropical storms and hurricanes in the Atlantic from 1851-present. Many of the tracks and intensities, especially in the earlier periods, are not very accurate and contain errors. Because the accuracy of this historical database is so important, the entire database is being reanalyzed. Chris Landsea is in charge of this project, and has been working on it since 2000. He's had a number of students contribute to the reanalysis project. Are you looking at data that no one has looked at before now, or did not take it seriously? We use any source of information about a hurricane that we can get our hands on. That includes some information that some people have looked at before, papers that have been published, as well as synoptic maps and other information that are only available at the National Hurricane Center. Many of those synoptic maps were hand drawn in real time by the operational forecasters in the '40s and '50s. This is like putting a picture puzzle together. That's right. Sometimes the picture isn't very clear. But other times, when there is more data available, the track and intensity of a tropical cyclone can be more accurately determined. There are cases for which the data suggest that no changes should be made to the database, and then we won't make a change. But there are other times when large mistakes in the database are found, and our recommended corrections will be sent to the NHC best track change committee, who has the final say for the changes to these historical storms to be officially approved. Is there anything from the 1944 to 1953 period that surprised you? There were a lot of U.S. landfalling hurricanes during the 10-year period, almost as many as from 1996 to 2005. A few of them were major hurricanes. Some were downgraded by a category after the reanalysis, others were upgraded by one category, and still others remained unchanged in intensity. What was really interesting was that we found, on average, two missing storms a season that were not originally in the database. That is thanks to the observations that were not seen in real time. That's 20 new storms we are recommending be added to the data base. Where is the focus of your work now? The goal of the reanalysis project is to move forward in years, but I have been spending the last year tying up some loose ends from the period 1931 to 1943. Once I finish that, the NHC Best-Track Committee will look at the recommendations from that period as well as the 1944 to 1953 period. The reanalysis team is up to 1954 now for the reanalysis research, and the Best-Track Committee is up through 1937 on approving the changes. We are hoping to advance into the late 20th century during the next couple of years. Obviously you can't do this the rest of your life because you are going to run out of storms. Where would you take all of this research experience? I enjoy research, and I also have a really strong interest in forecasting. I volunteered at the National Weather Service forecast office (WFO) in Charleston, South Carolina, during the summer of '06. Perhaps one day I will shift my career over to the forecasting side. Would that include hurricane forecasting? Certainly, if that opportunity were to arise..
Meteorology is real life! But besides the weather, I enjoy sports and spending time with family and friends.